The Afghanistan surge approved by the President includes two additional Navy Seabee Construction Battalions as part of the 30,000 additional military personnel bound for that war zone. Rear Adm. Handley, Commander of the First Naval Construction Division provided some great background and answered the questions of the bloggers present at the DoD Bloggers Roundtable this morning. The Admiral said one new battalion of Navy Seabees just arrived in Afghanistan and a second will arrive in March bringing the force up to four battalions in country. He emphasized the importance of their role in building infrastructure and adjustments to deployment schedules to meet the increased demand for the Seabees' construction capabilities. The Seabees first arrived in Afghanistan in 2001 to rebuild airfields for arriving American forces. 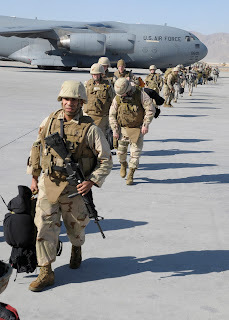 I flew a C-17 into Bagram and Kandahar airfields that year and the airfields were in real bad shape. The Seabees have been engaged heavily since with the challenges of logistics, travel, infrastructure, supply routes, etc being at the top of the list according to the admiral. The Seabee equipment is being deployed directly by air from Gulfport Naval Construction Battalion Center and Port Hueneme at Ventura County Naval Base and by sealift as well. The admiral said they had “sufficient” airlift but that the movement of heavy and outsized equipment had to be deployed by air due to road restrictions. Normally it would go by sealift to Pakistan then to Afghanistan over the mountain passes but the roads will not support the outsize loads. When I asked about the additional employments impact on the families and retention, Admiral Handley commented that he was extremely proud of their patriotism and efforts and that the Navy was working hard to support the family needs as well through the Fleet and Family Support Centers. He described the deployment changes to support the surge as a “concern”. The current schedule for active forces is 8 month deployment with a year at home but the new schedule reduces the year at home to 10 months. The bigger challenge is for reserve forces that would be active for one year and then not be called up for five years. The call up time has now been reduced to 3.5 years. During the next 6-9 months the active/reserve force mix in Afghanistan will transition to an even split of 2 battalions each. With four battalions in Afghanistan and other worldwide deployments the Seabee force is stretched thin. The Seabees are currently helping rebuild the ports in Haiti to increase throughput for relief supplies and have units deployed in Liberia, Cameroon, Djibouti, Philippines and other locations. The increased forces in Afghanistan means that an active battalion deployment has been extended by two months and some had a PCS (permanent change of station) looming but those sailors have volunteered to stay with their unit till the end of the extended tour. Thank you Seabees for your “Can Do” attitude! We are extremely proud of you and hope the rest of the nation and DC leadership recognizes this sacrifice! The Admiral also mentioned that the Seabees are going to have a museum at Port Hueneme in the future to document their history! Interested in learning more about the Seabee installations? Please go to Gulfport Naval Construction Battalion Center and Ventura County Naval Base (Port Hueneme) on MilitaryAvenue.com! You can find their Facebook and Twitter links their as well! To read the transcript of the Roundtable or listen to an audio of it please go to DoDLive! Thank you to the New Media Directorate of the Office of the Assistant Secretary of Defense for Public Affairs Defense Media Activity for their continued efforts to make military leaders like Admiral Handley available to bloggers for up to date information! You have a post up and everything! Wow, you are so much better than I am. Thanks Maggie! Fortunately I had time today to finish it before being overcome with events! The military community deserves our support during these war times and telling their story is one way to do that!